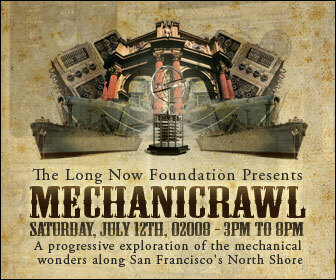 Mechanicrawl is a progressive tour through the mechanical wonders of San Francisco’s North Shore. You’ll be able to map your own route to see the SS Jeremiah O’Brien with it’s giant steam engine running, the most complex mechanical computer ever built, The Torpedo Data Computer aboard the USS Pampanito Submarine, over 200 coin operated machines, video games and turn of the century automata at the Musee Mecanique, the Orrey, Solar Synchronizer and new Walking Bearing at The Long Now Museum and Store, special films and exhibits at the Exploratorium and more. All of the participating organizations will be open, with special docents on hand, for the Mechanicrawl – you’ll be able to map your own route, at your own pace, between these locations. We’re encouraging people to walk, bike and use public transportation for the crawl, all routes are detailed on the website under the “Map Your Crawl” section. You can purchase tickets for Mechanicrawl, or join one of the participating organizations and get in free! Tickets are $15 for adults, $10 for children (under 6 are free) and $11 for students and seniors.